600 pages of communiqués by the Supreme Headquarters Allied Expeditionary Force lead by General Dwight D. Eisenhower. 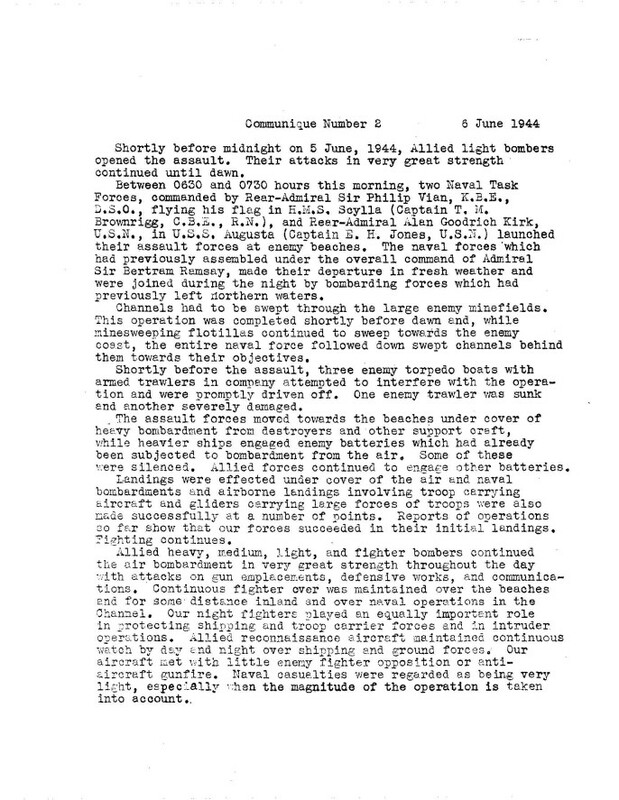 Communiqués from D-Day June 6, 1944, to the Germany's surrender, May 8, 1945, copied from material held at the Modern Military Records Division of the National Archives and Records Administration. 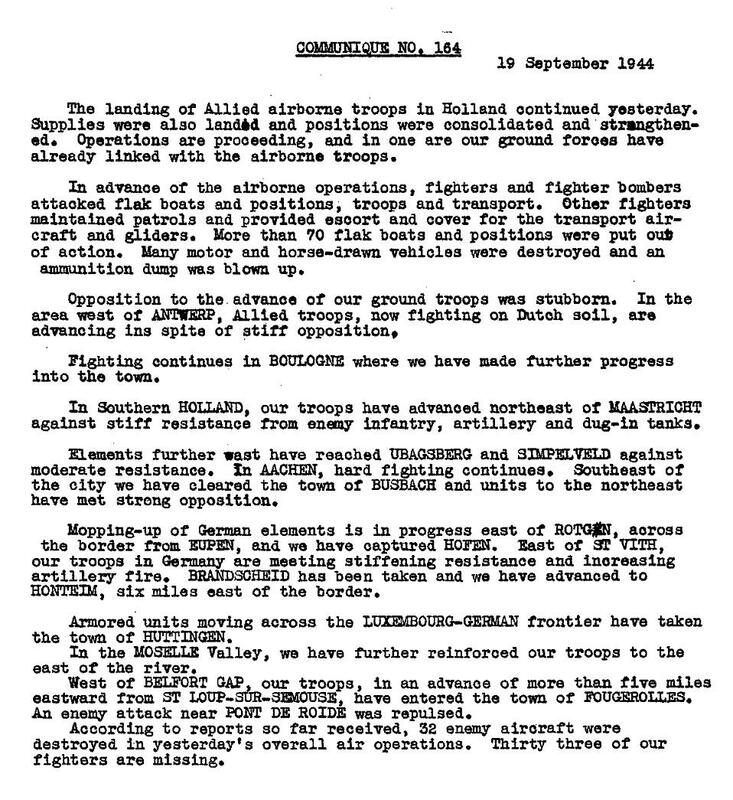 These daily battle reports, published by SHAEF, the Supreme Headquarters Allied Expeditionary Forces in Europe, had an additional use; they updated various branches of the Allied forces about the progress being made by SHAEF. 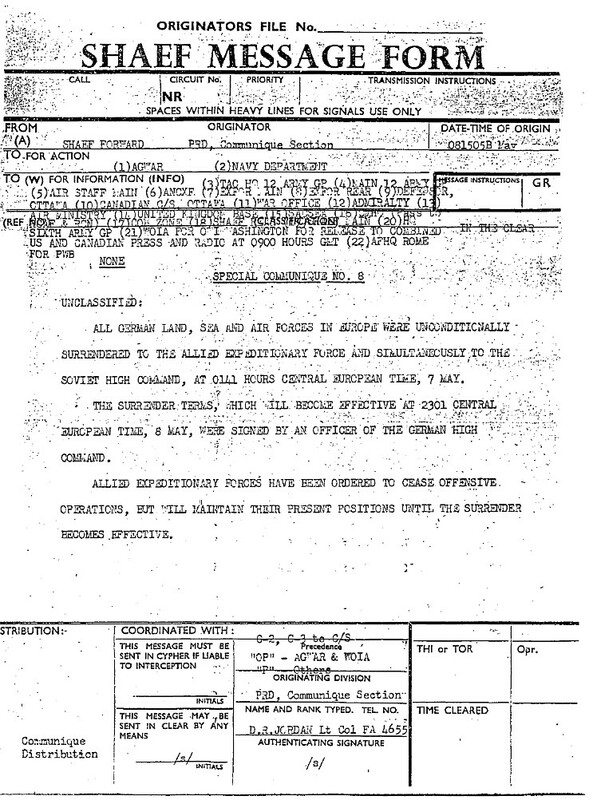 These dispatches were not classified as secret or confidential. 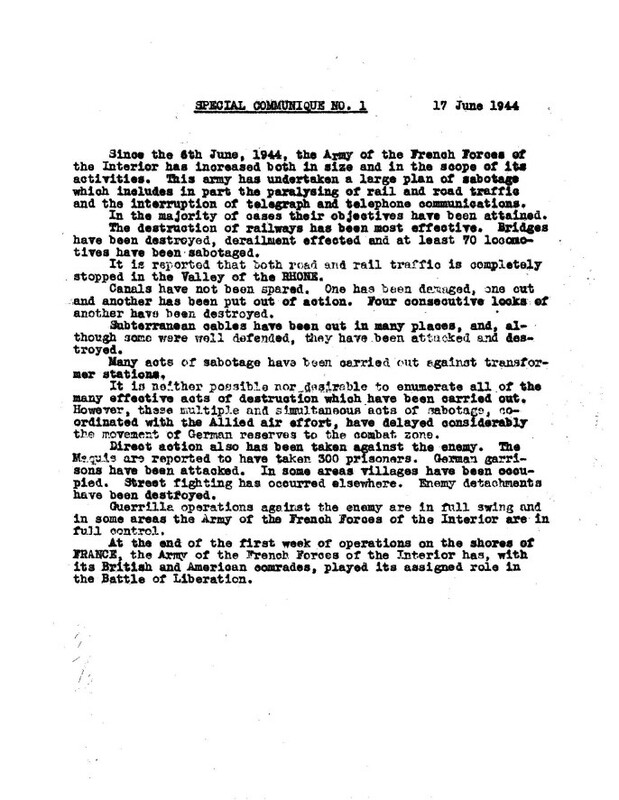 The primary purpose of the communiqués was to provide a guide for press radio and newsreel correspondents who were covering battlefront activities. The information in the bulletins are presented in a straight forward, business like, "just the facts" manner. According to Lieutenant Colonel D. Reed Jordan, who held the position of Chief Communiqué Section, Public Relations Division SHAEF, "descriptions of the horror, the suffering and the destruction that go with each shell fired and each bomb dropped were purposely left to the scores of talented news and photo reporters assigned by the worldwide news media to cover the day to day carnage of the war." The first communiqué was issued on the day of the Normandy Invasion to announce the commencement of the attack. Subsequent communiqués were released at 11:00 a.m. and 11:30 p.m. each day. They contained summaries of the military operations which had taken place since the previous communiqué had been issued. The frequency of the communiqués was later reduced to one per day, at 11:00 a.m., although special communiqués were issued at different times as events warranted. Communiqués were distributed to the British media in Europe and to the Office of War Information in the U.S. which forwarded them to U.S. and Canadian journalists. The communiqués are part of the SHAEF records at the National Archives in Washington, DC. They were originally filed together in reverse chronological order by the SHAEF staff. After the communiqués were received at the National Archives the Archives staff rearranged the documents into straight chronological order and created a separate file for the special communiqués. 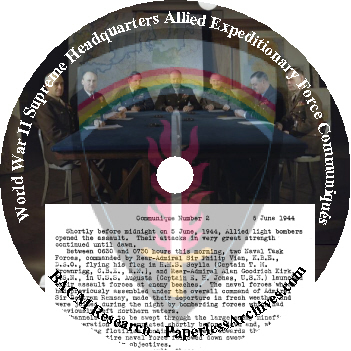 SHAEF was created on February 13, 1944 to replace and absorb the planning group called the Chief of Staff Supreme Allied Command or COSSAC, which had been established in April 1943. COSSAC and SHAEF, integrated U.S.-British organizations, had the task of integrating the British forces and the American forces for operations on the Continent. General Dwight D. Eisenhower was designated as the Supreme Allied Commander, Allied Expeditionary Forces, and on his arrival in England from the North African Theater in January 1944, Eisenhower became the commanding general of the European Theater of Operations United States Army (ETOUSA). The staff organizations of SHAEF and ETOUSA were, however, distinct. Each headquarters as a rule had its own staff sections manned by separate personnel. The staff organization in SHAEF was headed by the Chief of Staff. SHAEF directed the operations of several subordinate inter-allied headquarters, including separate commands for ground, air, and naval operations. SHAEF was located at London until August 1944; at Versailles, France, August 1944-May 1945; and at Frankfurt, Germany, May-July 1945. On July 14, 1945, SHAEF was discontinued, and its civil-affairs and military-government functions were assumed by the Allied Group Control Council, in Berlin. June 6, 1944 - The launch of D-Day. The invasion lands 155,000 Allied troops on the beaches of Normandy in France. The allied soldiers quickly break through the Atlantic Wall and push inland in the largest amphibious military operation in history. June 17, 1944 - Free French troops are placed on Elba. June 26, 1944 - American troops reach and liberate Cherbourg, France. August 25, 1944 - After the Germans surrender Paris, De Gaulle and Free French forces parade triumphantly down the Champs-Élysées. August 28, 1944 - General Patton moves his tanks cross the Marne. September 13, 1944 - American troops reach the Siegfried line, the West wall of Germany's defense system. November 18, 1944 - The Third Army crosses into the German frontier. December 16, 1944 - The Battle of the Bulge begins when German forces attempt a breakthrough in the Ardennes region, Germany's final offensive in the west. By January 1, 1945, the Germans are in retreat. February 13, 1945 - The bombing of Dresden. March 7, 1945 - Patton's Third Army crosses the Rhine at Remagan. March 20, 1945 - Patton's troops capture Mainz, Germany. May 7, 1945 - German Chief-of-Staff, General Jodl, signs Germany's unconditional surrender.